After surprisingly bowing out of the M3 Rock Festival‘s 2018 edition, it strongly appears that L.A. Guns will be playing and presumably headlining the post-M3 event Sleazy Slimey Sunday hosted by Brad Lee Entertainment at the Cancun Cantina in Hanover, Maryland, USA on Sunday, May 6, 2018. Brad Lee Entertainment‘s principal Brad Lee had posted some hints on Facebook in that regard shortly after L.A. Guns announced that they were no longer playing this year’s edition of the M3 Rock Festival. A post from L.A. 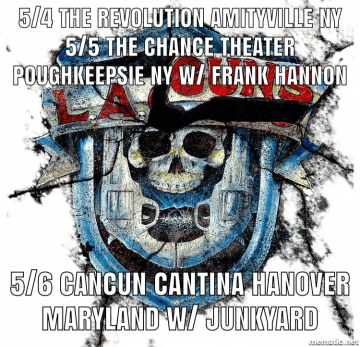 Guns guitarist Tracii Guns‘ Facebook account from earlier today indicates a list of the band’s upcoming shows including in Hanover, Maryland with Junkyard on May 6, 2018. Junkyard are currently scheduled to headline the third edition of Sleazy Slimey Sunday on May 6, 2018. Other acts consist of Babylon A.D., Ted Poley, Kickin Valentina, Every Mother’s Nightmare, Streetlight Circus, Denman and Old School.